Ours is a prominent name of the industry, which is engaged in manufacturing, supplying, trading and wholesaling a qualitative range of Speed Humps (Bumps) /Speed Breakers. The offered array of speed breakers is manufactured by our professionals in complying to the international standards of quality. These speed breakers help in controlling traffic and accidents in roads. Further, our respected customers can avail these speed breakers from us at industry leading prices. Features Available in both Yellow and Black colour Which Enhances Visiblity. We have been able to cater to the various requirements of clients by providing a wide array of Plastic Speed Hump. Highly resistant to brutal weather conditions and various impacts, these speed humps are manufactured using superior-grade plastic that is obtained from reliable vendors of the industry. Easy in installation, our offered humps are modular and compact in design, which has affixed night vision reflectors with glass metals on both sides of humps. Rubber Speed Breaker or Speed Bumps that we provide are perfect to have complete control over speed. 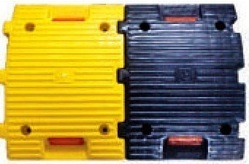 With Rubber Speed Breaker, speed can be reduced, and therefore these are widely demanded throughout the market. We ensure that Rubber Speed Breaker is tested on parameters such as strength and durability before dispatching to the customers. We can deliver bulk consignments of Rubber Speed Breaker.